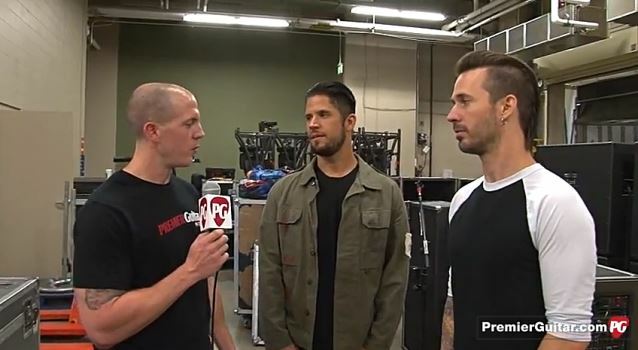 On August 25, Premier Guitar 's Chris Kies was on location in Cedar Rapids, Iowa where he caught up with PAPA ROACH's Jerry Horton and Tobin Esperance. The guys talked about condensing their rigs from arena-ready juggernaut stacks to carry-on-approved size. Horton spoke about collaborating with Schecter on his signature Solo 6, and Tobin explained why picks aren't his thing. Check out the footage below. As previously reported, former PAPA ROACH drummer Dave Buckner reunited with the band at the Aftershock festival in Sacramento on September 14. Buckner took the stage at Discovery Park to perform "Last Resort" with his former bandmates. After leaving the band in 2008 because of substance abuse issues, Dave filed a lawsuit claiming he had not received his fair share of the band's gain. Despite the lawsuit, frontman Jacoby Shaddix told The Pulse Of Radio back in early 2009 that the legal issues did not affect his personal feelings toward Dave by explaining, "Legal is legal, we know, though it's like a hint of a lawsuit is to disintegrate his business attribute with us, that is totally understandable. But as distant as like personal goes, I, we know, we wish no ill will on him." The band replaced Buckner with ex-UNWRITTEN LAW drummer Tony Palermo.